The tigress crouches as she stalks her prey, her eyes dilated to take in the sparse light of a cloudy night. Closer and closer she moves on silent, padded feet. Her prey shows no awareness of its danger. Suddenly, she pounces, administering the killing neck bite and rapidly disemboweling her prey with her hind claws. She is once again victorious – the squeaky mouse is no more! Anyone who lives with a cat as an animal companion has undoubtedly witnessed the described scenario time after time. Even after countless thousands of years of living with humans as domesticated animals, our feline companions still manifest many of the wild behaviors of their larger cousins – leopards, tigers, and other species that we group together as “great cats”. Acting a little like their wild brethren is one of the numerous reasons we adore cats. However, there has been a growing movement among cat breeders to bring some of the wild closer into our homes. Hybrid cat breeds are being created more and more frequently as breeders try to create miniature leopards and other types of more exotic, wilder looking cats with which we can share our lives. The creation of hybrid cats first began as part of a scientific effort in the 1970s to study possible resistance to Feline Leukemia (FeLV) in wild cats. These studies aimed at better understanding heredity factors for leukemia and combatting that disease. Domestic cats (Felis catus) were bred with the Asian Leopard Cat (Prionailurus bengalensis), a small wild cat native to South, Southeast and East Asia. After their time in the research lab was complete, some of these early generation hybrids were given to people as pets, and the movement to create “little leopards” and other exotic/wild looking cats was born. Over the years, breeders worked to incorporate the wild coloring of these hybrids into more domestic stock, and in the 1980s the Bengal breed became official. As the Bengal breed and demand for exotic looking cats took off in more recent years, other hybrid cats were also engineered. 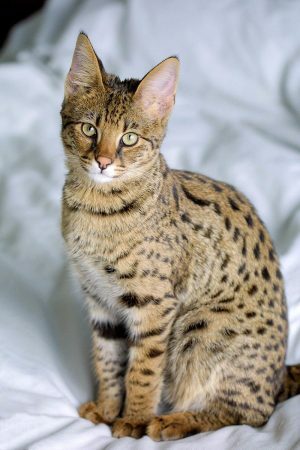 Some of the more common hybrid cats available now include the Savannah and the Chausie. Savannahs resulted from crossbreeding a Serval (Leptailurus serval, a wild cat found in Africa) with the Domestic cat. The Chausie hybrid resulted from crossbreeding a Jungle Cat (Felis chaus, a wild cat native to the Middle East, South and Southeast Asis, and southern China) with the Domestic cat. In hybrid breeding terms, the first three generations resulting from these engineered matings are called foundation generations, or F1-F3. Breeders use these foundation generations to create additional generations of hybrids. Although they are being used to breed “domestic” hybrid cats, F1-F3 animals are essentially still wild cats with the aggressive tendencies that one would expect from a wild animal. These early generation hybrids are often prohibited and/or regulated by state or local laws. The F4 and later generations are considered “domestic” hybrid cats that can be sold to the general public. Breeders advertise these cats as having the look of the wild with the personality of the domestic cat. However, they don’t fully educate potential owners regarding the common health and behavioral issues secondary to this hybridization. After all, who wouldn’t want to sell a hybrid kitten for $20,000 instead of a purebred Domestic breed of cat like a Burmese for only $2,000? Interbreeding wild cats like Servals, Asian leopard cats, or Jungle cats with domestic cats for a few generations does not make the result a domestic cat. Throwing a few generations of domestic cat bloodlines in the mix does nothing to counter the evolutionary process that, over thousands of years, created these wild cats in the first place. Hybrid cats are still genetically programmed to be wild. The F4 or later generations of these hybrid cats are simply exotic looking cats with wildcat tendencies. The largest number of behavioral complaints from owners of 4th generation or later hybrid cats fall into two categories – lack of litter box use and aggression. Far too many hybrid cats are turned into shelters or “big cat” sanctuaries for these two issues. Outdoor wild cats traditionally mark their territory by urination, spraying, or leaving scent markers via scratching on objects (trees, rocks, etc.). Although we can even see this behavior in some thoroughly domestic cats for various reasons, marking territory through urinating outside the litter box or through destruction of property (furniture, clothing, etc.) is much more of an inherent behavior in hybrid cats. Some cats will urinate along the boundaries of a room, as they would the boundaries of any wild territory they inhabited. Neutering or spaying a hybrid cat will not change the behavior. uncontrollable house-soiling issues. Aggression is also common in hybrid cats. Other than lions, wild cats are solitary by nature. They may not adjust to being in a social setting with people, and can act in very unpredictable ways. This can include attacking members of the household if approached for petting, or injuring other animals in the same home. They may be more apt to attack other animals (cats and even dogs) in the neighborhood as well if allowed to roam. Hybrid cats are an unnatural breeding. Fundamentally they are the product of two species that were never meant to mate in the first place. Breeders can end up with aborted pregnancies or premature births when nature determines that something is amiss. Some of the more common illnesses among hybrid cats include digestive issues such as IBD (a painful irritable bowel disease), or persistent infection with an intestinal parasite called Tritrichomonas foetus. Both medical issues can cause chronic diarrhea and may be both difficult and discouraging for both the owner and the veterinarian to treat. Additional medical issues in some breeds of hybrid cats include Hypertrophic Cardiomyopathy (HCM), and possibly a higher incidence of FIP (Feline Infectious Peritonitis). Wellness protection for hybrid cats is also a medical issue. Vaccinations normally used to protect our feline companions from disease have not been approved for use in hybrid animals. While these vaccines are considered safe to use in hybrid cats, manufacturers cannot assure their effectiveness due to lack of testing. There is no doubt that hybrid cat breeds spark our imaginations with exotic images of leopards and other great cats. However, obtaining a hybrid cat should involve the same type of deliberate and reasoned thought that should be involved in adopting or purchasing a truly domestic cat. Look at your individual situation and lifestyle, and at the pros and cons of living with a particular animal for the rest of their lives. And please consider the millions of cats euthanized yearly in shelters already due to lack of adoptive families. So instead of bringing in reminders of the jungle or the savannah into your home by buying a hybrid cat, think of the tiger or leopard or lion that is in the heart of each and every domesticated cat. Little cats are like big cats in more ways than one (https://www.youtube.com/watch?v=y_wZtP5Nn9M)!